reactions in the body. Enzymes, sometimes called catalysts, are a fundamental component of the chemistry of life. There are two broad groups of enzymes that need to be defined. The first group is known collectively as digestive enzymes, substances that are secreted by the gastrointestinal tract and responsible for the digestion of food. The second group is referred to as systemic, or metabolic, enzymes. The words systemic and metabolic imply that these enzymes support body chemistry and that they drive body functions and support body structures. 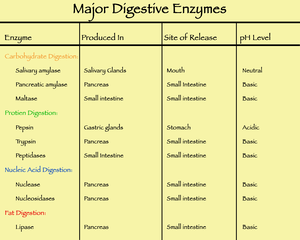 Functions of Enzymes Enzymes act in a manner that causes many different changes in body structures and functions. Examples of the vital role of enzymes include growth and repair of tissues, chemical alteration of drugs or chemicals in the body, regulation of hormone secretion and the balanced transmission of nervous impulses in the brain. Enzymes must be present to break down nutrients into simple forms that support the structure of the body. The function of enzymes themselves is often dependent upon the presence of vitamins and minerals or other nutritional co-factors. Enzyme Harmony There are several thousand metabolic enzymes in your body that work in harmony to run chemical reactions in all body tissues. One group of metabolic enzymes exerts an antioxidant action, helping to remove free radicals or potentially damaging substances such as hydrogen peroxide. Free radicals are a common by-product of oxidative reactions, which can damage tissues in many ways. These enzyme antioxidants are manufactured by the body and examples include superoxide dismutase (SOD), catalase and peroxidase. These three enzymes are very important in the body’s ability to detoxify and defend itself against oxidative damage. A simple example of oxidative damage to the body is muscle pain that occurs after heavy exercise. Muscular activity generates free radicals, and that is why antioxidants are used increasingly by aerobic fitness enthusiasts and “weekend warriors” in the gym. Metabolic Enzymes Metabolic or systemic enzyme support has been reported in medical literature as useful for many areas of health, including supporting cellular health, healthy inflammatory response in the body and more. Conventional medicine, however, has tended to reject the value of metabolic supplementation. A major problem in acceptance of supplemental enzymes by modern science is the question of whether or not metabolic enzymes are adequately absorbed by the gastrointestinal tract. Some well-conducted studies show that many types of enzymes are absorbed, including combination enzyme preparations containing bromelain, chymotrypsin, pancreatin, papain and trypsin, even though their absorption is incomplete. Dietary supplements have been produced containing very important enzymes that are found in the human body, such as SOD, catalase and peroxidase, but these enzymes may not be efficiently absorbed, or they are unstable in their regular chemical forms. Enzyme support is not simple because many factors alter the activity of enzymes, especially when taken as dietary supplements. These factors include the amount of material present that an enzyme can act on, acidity or alkalinity of the body, body temperature and the presence of other nutritional factors (co-factors) that are required to make enzymes function effectively, such as essential vitamins and minerals. It seems obvious that many enzymes are destroyed by stomach acid when taken as dietary supplements (e.g. lipase). This can be overcome to some extent by increasing the amount of enzymes administered in oral supplements; and in some cases by applying special coatings (enteric coating) to enzyme capsules. There is a wealth of literature on the use of metabolic enzymes, but enzymes from different sources, manufactured using different methods, have variable biological activity. Quality enzyme supplements are tested to ensure activity levels of the enzymes used. Potential Use of Nutritional Support with Metabolic Enzymes The most common and effective use of several metabolic enzymes is to support healthy inflammatory response in the body. Reports of the successful use of metabolic enzymes in the nutritional support of cardiovascular health are also of major interest. It has been suggested that several metabolic enzymes may contribute to healthy blood consistency. However, any attempts to address blood health must be performed with the informed judgment and supervision of a medical practitioner. Be Healthy! Dr. Stephen Holt, M.D.